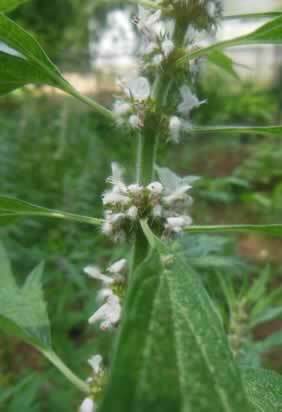 Preparation Methods & Dosage :Motherwort is available in capsule and extract form, but is most useful taken as a tea. The somewhat bitter taste can be mellowed by adding spices or sweeter tasting herbs. Frequently combined with hawthorn for heart tonics. Motherwort Side Effects: Motherwort contains alkaloid stachydrine. Because of its ability to stimulate uterine contractions, it is not recommended during pregnancy, except during the last few days, when it is used to stimulate labor. Flowers:Dull purple pink, pale purple, or white, small, clustered in axils of upper leaves. Calyx tubular, bell-shaped, with 5 rigid awl-like teeth; corolla 2-lipped, upper lip arched, woolly without; lower lip 3-lobed, spreading, mottled; the tube with oblique ring of hairs inside. Four twin-like stamens, anterior pair longer, reaching under upper lip; style 2-cleft at summit. Stem: 2 to 5 ft. tall, straight, branched, leafy, purplish. 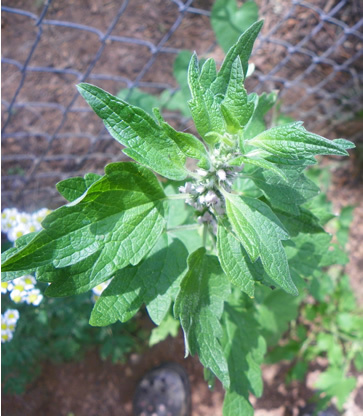 Leaves:Opposite, on slender petioles; lower ones rounded, 2 to 4 in. broad, palmately cut into 2 to 5 lobes; upper leaves narrower, 3-cleft or 3-toothed. Preferred Habitat:Waste places near dwellings. Distribution:Nova Scotia southward to North Carolina, west to Minnesota and Nebraska. Naturalized from Europe and Asia. How the bees love this generous, old-fashioned entertainer! One nearly always sees them clinging to the close whorls of flowers that are strung along the stem, and of course transferring pollen, in recompense, as they journey on. Perennial, self seeds generously. Full sun. Harvest when flowers in mid to late summer. Active chemical components are at their highest concentrations when the plant is in bloom.